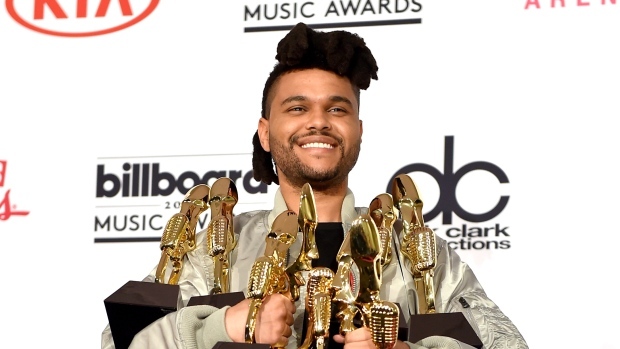 The 2016 Billboard Music Awards has just wrapped up with The Weeknd emerging as the big winner of the night! Not only did the one-man-act garner the most nominations, he also won a total of eight awards including Top Song Sales Artist, Top Radio Songs Artist and Top Hot 100 Artist. (L-R) Britney Spears, Demi Lovato, Nick Jonas and Meghan Trainor. Meanwhile, Brit songstress Adele won five awards including Top Artist, Top Female Artist and Top Selling Song. Hosted by Ludacris and Ciara, the annual prestigious event featured a stellar line up of performances including Madonna who did a Prince tribute performance, Rihanna who performed her latest song “Love on the Brain”, Britney Spears who did a medley of some of her greatest songs, and Kesha with her cover of Bob Dylan’s “It Ain’t Me Babe”. Some of the performances at the event. Apart from that, Britney Spears also received the Billboard Millennium Award to acknowledge her success in the music industry while Celine Dion received the Billboard Icon Award in recognition of her career spanning over three decades. (L-R) Steven Tyler, Ciara, Priyanka Chopra and Shawn Mendes. (L-R) Kesha, Rihanna, Ariana Grande and Wiz Khalifa. Here are all of the winners for the Billboard Music Awards!